Walk into tiny La Shish Kabob on Charlotte’s East Side and you’re in Jerusalem. Young couples talk animatedly in Arabic and English over platters of kabobs and rice. A big family, grandparents to pre-schoolers all dressed in their best, celebrates a university graduation. 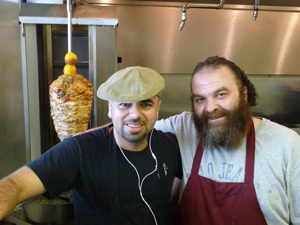 Behind the counter, wiry Nabil Al Nataha and burly, bearded Izzat Freitekh dish up hommos wraps, tabouli salad and stuffed grape leaves. Sword-like skewers of ready-to-grill lamb, beef and chicken reside in a glass case. Here as in Jerusalem Freitekh’s signature “sandwich” is the shawarma wrap. Shawarma, a close cousin of the Greek gyro, is the most popular street food everywhere in the Middle East. Marinated chicken — “fresh, never frozen,” Freitekh emphasizes — is stacked onto a spear, which turns next to a gas flame. Lemons and tomatoes on top add flavor as the spear rotates, searing and slow-roasting the chicken to lock in juices. Place your order and Freitekh shaves off slivers of meat, gives them a quick finishing on the flattop grill, then tumbles them into pita bread, along with crisp little pickle spears, bits of tomato and cucumber, and garlic tahini mayonnaise. Big flavor, with the speed and convenience of fast food, but hand-made in front of your eyes.